Just 2 weeks after releasing a bunch of unheard Ovuca material, the prolific Aleksi Perala has put a new Astrobotnia album up for sale on Bandcamp titled Part 00. 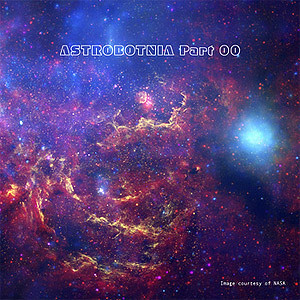 All of the music included in this album was produced in 2001, taking us back in time not only to some of the earliest Astrobotnia material ever recorded, but also to a high point of the IDM era. Aleksi tells us that Part 00 should be considered the definitive prequel, the earliest recordings pre-dating Parts 01-03 that served as the birth of the Astrobotnia project, a sonic exploration of space and time. Though composed entirely on a laptop with endless sound and style options, Astrobotnia demonstrates a disciplined focus from day one, choosing to create beautiful otherworldly atmospheres by combining ambient synths and strings with complex and sometimes harsh beats. Track 2 "New Earth" is a perfect example of this, wherein a fusion of electronic and acoustic hand drums smack out tribalesque toe-tapping rhythms while floaty, spatial chords shimmer and swirl all around you, making you feel as though you are somewhere that gravity nor time are of any importance. Soundscapes like that of "Rainforest" also contain hints of world percussion and concrete sounds giving them a grounding familiarity, but the injected electro alien beats and strange, unsettling non-melodies spark the realization that you're in an alternate dimension. Though focused, Part 00 delivers a fine showing of dynamic range from the beatless to the beat-down. "Hydrocortisone Saga", "Unknown Variable", and "Space Camp" all exude a warm and relaxed nostalgia within the artist's original framework, perhaps what Boards of Canada would have sounded like had they been from another galaxy. On the other end of the spectrum we have tracks like "The Message" and "Fever" that both crush you and make you want to dance with a caustic, ear-shattering force. Part 00 is absolutely gorgeous and an obvious must-have for any Astrobotnia fan or classic IDM loyalist. My only regret is that it's not available on vinyl (yet). What else does Mr. Perala have up his sleeve?